This is my first Meat Bird Journal. For more info about me and an attactive photo of my schnauzer - see "Homepage" link above. Total price for 14 chicks plus shipping = $36.28, plus an additional $1.75 insurance (which was optional.) Total price per chick: $2.72 apx. 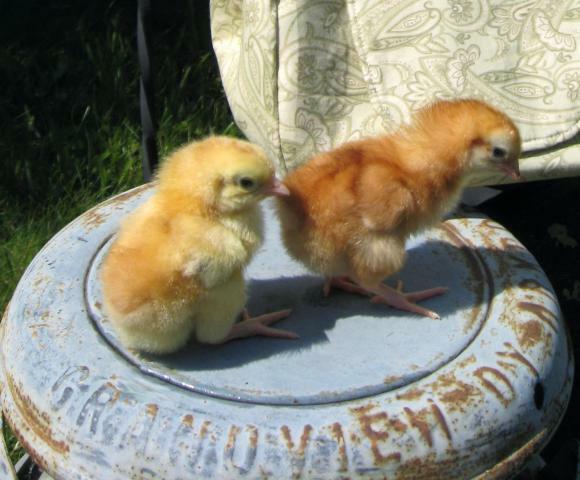 Tuesday, June 21,2011: Chicks go outside for the first time for 2 hours. Saturday, June 25, 2011: Chicks go outside for the second time for 1 hour. Monday, June 27, 2011: Chicks go outside for fourth time for 1 hour. The first chick with a red comb and red wattles is obvious. I'm assuming he's a roo. He went head to head with my almost adult GLW chicken and after a posturing, the chicken ran away. It was quite a sight. He also "attacked me" when I picked up one of the other chicks who began to scream. If he were to live to see adult roo, he would be quite an aggressive one. I noticed a red dot in one of the chick's poo. I'm going to pay attention to their poo now because if it's cocci, I'm going to want to nip it in the bud. Wednesday, June 29, 2011: Chicks go outside for the fifth time for 1 hour. They are getting too large for their brooder and are constantly knocking over their water, making it a sloppy mess. They will be moved outside to a tractor this weekend. I'm eager to see Friday's weights. Feathers are coming in quickly. I'd like to add that they aren't extra messy because they're "meat chicks." They're just extra messy because they're larger at this stage than my other chickens were - thus needing a larger brooder. If they weren't knocking over their water all the time - it wouldn't be so bad. Chicks that eat a lot = chicks that poop a lot. It's fine, though. No complaints. Thursday, June 30, 2011: Chicks go outside for sixth time for 1 hour. Friday, July 1, 2011: Weight taken of each bird. 10.696oz AVG Birds go outside for seventh time for 1 hour. Saturday, July 2,2011: Chicks go outside for eighth time for 2 hours. Sunday, July 3, 2011: Feed purchased: Southern States "Sporting Bird Flight Developer" also known as by my feed store to be "Poultry Game Starter Unmedicated" Crumbles. 50lb bag. 22% protein. $16.99. Sunday, July 3, 2011: Chicks go outside for ninth time for about three hours. A massive storm came through (rain that we desperately needed) and caught myself and the chicks off guard. It was absolutely pouring. The chicks got completely drenched. We brought them in, dried them with paper towels and put them in a clean brooder. For the past two nights - we have not used the heat lamp and everyone seems fine. There's no crowding, even though the brooder is tight as it is. Monday, July 4, 2011: The chicks go outside for tenth time and spend most of the afternoon basking half under a tree and half in the sunshine. When I say "chicks go outside" I mean they are protected by a tall portable dog fence. I know where they are at all times and check on them frequently. My BF and I built our meat tractor today. We just need to finish painting the underside of it tomorrow and add a couple padlocks to the portion that opens and we'll be done. Photos to follow. Tuesday, July 5 2011: Chicks go outside for eleventh time for about two hours. The tractor is ALMOST done. I'm restricting food at this point: All they can eat during the day and nothing at night. It's day two of that. I don't know if I'll continue to do this or to just ration out what they eat over a longer period of time. When they eat now - they eat so quickly that they stuff their crops to the point that it looks like it will burst. They continue to sleep with no heat lamp. It's warm here and they're getting feathers nicely. Thursday, July 7, 2011: The tractor is finally done! The birds are now outside. Photos and more information can be found in post #9 of this thread. Wednesday, July 13,2011: Weights are being postponed a week. Unfortunately, I found out that my chickens have exceeded the weight allowance of my scale. I need to purchase a new one! While that's pending - weights are postponed until Friday, thus skipping a week of measurement. Saturday, July 16, 2011: The tractor was accidentally dropped on one of the chicks feet while we were moving it. It was too dark out and we should've been doing it when it was lighter. We lifted it off of him. He's able to walk, but he's limping. The leg has a scratch on it, but I'm more concerned with the leg being broken, but I'm note even certain that's the problem. I'll check on him again in the morning. I don't want him to suffer, so if I feel that's the case - he will be culled. Sunday, July 17, 2011: The injured cockerel seems to be ok for now. He's limping on the leg, but it looks better than last night. He was eating and drinking like normal this morning. He's not pecking at his leg or paying attention to it and neither are the other birds. I'll continue to monitor him to make sure he's fine to walk and do other normal chicken things. As soon as I feel he's unable to do those things - he'll be the first culled. Monday, July 18, 2011: I do believe we're going to start moving the tractor twice a day. I have been lazy with purchasing a scale to weigh the meaties. Thursday, July 28, 2011: Feed purchased: Southern States "Sporting Bird Flight Developer" also known as by my feed store to be "Poultry Game Starter Unmedicated" Crumbles. 50lb bag. 22% protein. $16.99. Tuesday, August 2, 2011: We have our first crowing roos. I can't believe they're crowing so young, but they're doing it. I've noticed that the chicks much prefer eating their food if it's wet. They haven't been eating so much because it's been incredibly hot here, so when it gets cooler at night, I make a mash out of their crumbles with water and they eat it right up.